Asgard Fencing Club - SEA Games 2015!! The biennial South-East Asian Games were held in Singapore this June for the first time since 1993. 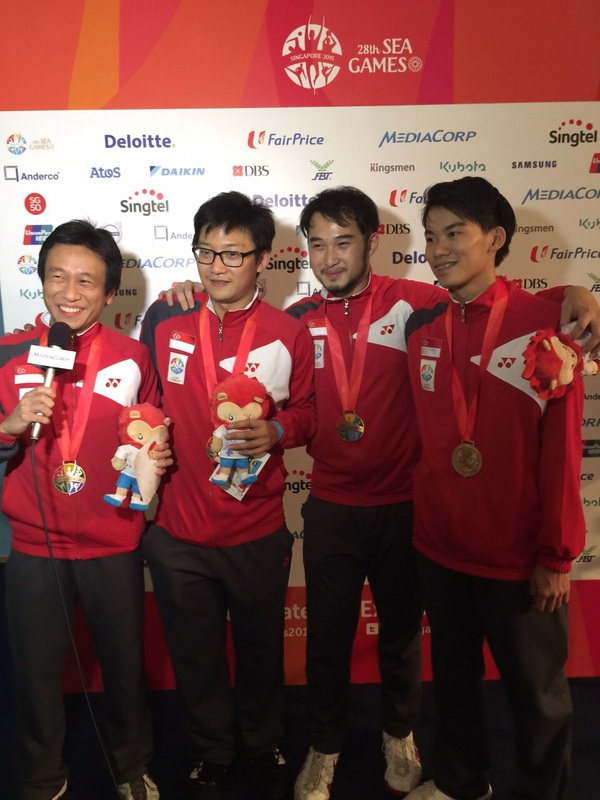 Many of our current athletes would have no memory of that previous event, but they will surely retain the memory of this SEA Games experience as Singapore Fencing powered to the best-ever result of 3 Golds, 3 Silvers and 7 Bronzes, far exceeding the previous haul of 1 Silver and 2 Bronzes. This was the first time that a Singaporean athlete stood on the podium for every single event, and every member of the SEA Games team returned with at least one medal for their efforts. It is testament to the hard work of the coaches, athletes, and the incredible support from all parents, friends, and members of the community. We can be immensely proud of our Asgard fencers as they returned with several accomplishments. Ywen finished with a double bronze in both the individual and team event, becoming the youngest ever Singaporean fencer to win an individual medal at the SEA Games. Sharmaine and Coach Ann also returned with bronze medals from the team event after losing out against eventual champions Vietnam. Coaches Clive and David also did well in finishing with bronze medals in the team event. This was also a momentous occasion as it is the first ever team medal for Men’s Sabre in twenty-two years (since 1993) as well as Coach David’s last SEA Games as he will be stepping down as an athlete and national sabre captain after this season. Records were also set in the other weapon events, with the Epee teams finishing with the most number of medals – 2 Silvers and 3 Bronzes. The Men’s Epee team also finished with two individual medals for the first time in history, with Samson Lee winning Bronze and Lim Wei Wen winning Silver. Both teams lost their matches by a heartbreaking single point to finish with a Silver for Men’s Epee team and Bronze for Women’s Epee team. Finally the biggest winners were the Foil teams, which finished with an amazing 3 Golds and 1 Bronze (to put this in perspective, up till the 2015 SEA Games, Singapore had won only 3 golds in its entire history). Congratulations to Wang Wenying who won an unprecedented double Gold and to both Men’s and Women’s teams who were very convincing champions as well. This has certainly been a Games to remember, and we look forward to even greater achievements in the future! Countdown to the SEA Games!